Apparently when you toast a cask to stratospheric levels you get clear lines that form along the inside of the staves, right along the woodgrain. Lines… or Grooves. Hence… you know, Ardbeg Grooves. Get it!? Sigh. Anyhow, I took part in Ardbeg Day this year, and got my hands on a little sample as well as some more background information. I’ve been reliably informed that Ardbeg Grooves uses said ultra-toasty casks in conjunction with some proportion of Burgundy cask maturation… an odd combo, to go with an odd bottle, but willing to give it a bash! Okay, smells lovely. Peat up front, fruity and creamy. A whiff of salt in the background, vanilla, oak and caramel. Grassy, mossy. Basically… Ardbeg! Perhaps unfairly (?) I was in the lucky position to taste Ardbeg Grooves side-by-side with the 10-year-old, Uigeadail, Corryvreckan and the newly released An Oa. Putting pretty much anything next to Uigeadail is an unfair fight, but the comparison between the other three was fairly illuminating. At first sip there’s no doubt you’re drinking Ardbeg. At second sip, it’s tough to determine whether you picked up the correct glass and aren’t, in fact, drinking Ardbeg 10. Corryvreckan has that high ABV punch (great stuff) and An Oa that delicious combination of old-furniture and candlewax that floats my boat. But Grooves? Very tough to distinguish from the traditional 10. So much so that I’d suggest reading my review of Ardbeg 10. To that, add an ever-so-slightly woodier influence, a slight taste of pumpkin and (I’m pushing here) something that borders on prunes or raisins. An interesting variation, if perhaps a little subtle overall. It’s about as delicious as Ardbeg 10, which is of course saying a lot. I LOVE Ardbeg 10. Ardbeg 10 helped me come out of the peat-closet, after years of fervent denial. You get a solid hit of Ardbeg malt, bottled at Ardbeg strength and dripping in Ardbeg peat. So… why not just buy Ardbeg 10? Unfortunately that’s exactly where my thoughts take me. 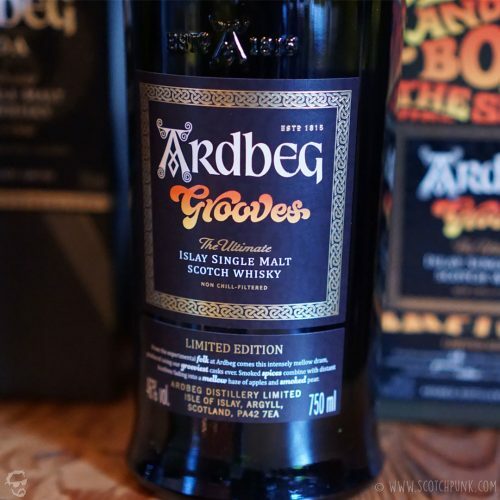 Unlike previous Ardbeg Day releases (all of which have been mega-hits or wide-misses) the Grooves plays it too safe, deviating so little from the formula that is hardly deserves the “special” in “special edition”. Grooves is perfectly tasty, fun and down-to-earth. But Ardbeg 10 is equally scrumptious, always available… and significantly cheaper. Long live Ardbeg 10!